Caption : Kochi,11/04/10. 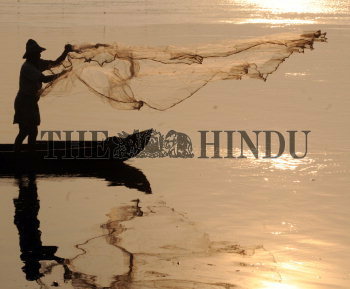 Kerala government has placed a bill before the Assembly to regulate fishing in inland water bodies. The bill is also aimed at preserving the resources and also preventing use of destructive methods of fishing like use of explosives. A scene from Vembanad lake near Chellanam in Ernakulam District. Photo: H. Vibhu.